Bookshelf invitation: play with us! 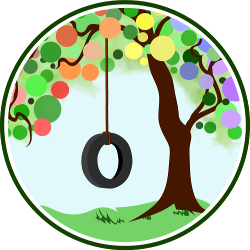 Years ago, a homeschooling mom on an an online forum used the word “strewing” to describe a particular method of engaging her kids in exploration, play, and learning. The basic concept is to leave interesting objects, materials, or combinations of things out as a quiet invitation to your child to notice it, touch it, explore it, use it and most importantly, have fun in the process. I consider it quite non-coercive and low key — there is no pressure. If they don’t “take the bait” or are just not interested, that’s fine! But often, I find, they do. Some of my girls’ best play sessions happen when they come downstairs from a good rest or in from an outing to discover something new I’ve set out. Something sparks for them, and they dive right in, running with it in a way I may or may not have initially imagined. I see strewing as a way to start a “conversation” with my kids — not a verbal one, but one of ideas, objects and playfulness. My role is that of a tour guide — one whose goal is not to chatter endlessly but to quietly assess what my passengers are interested in — what might pique their fancy — and drive the car in a direction where they will see things that both delight and engage them. Strewing is a way to head my kids towards something they might not have seen before (or have just overlooked), or to invite a type of play that they might not have come up with on their own. We all fall into ruts, sometimes, but then we see, hear or read or try something different, we take a leap or are whisked away, something clicks and we are changed, renewed, invigorated. 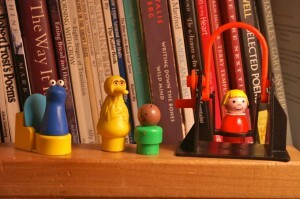 As a parent of three young children, one aspect of strewing is a simple toy rotation. We are blessed with many toys — too many, in fact! — and having them all out is overwhelming, visually and organizationally. In the past I have used large lidded tubs to sort out groups of toys to pull out and put away, daily, every other day, or weekly, and am amazed at how much more excited and interested my kids are in a toy, puzzle, manipulative or game they haven’t seen for awhile. Sometimes just my taking the toy off the shelf and and setting it out in an inviting way is all that’s needed. 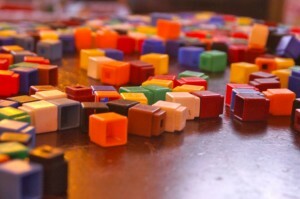 In a similar vein, I find that the art of strewing involves pulling out different combinations of toys and materials that stimulates my kids to play or create in new ways. For instance, my kids sometimes love playing with a set of plastic animals, but after awhile they lose interest. 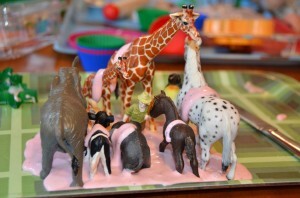 Casually setting out the animals next to a tray of playdough or flubber, lined up near our set of tree blocks, or perhaps dumped into the empty kiddie pool taking up space in our backyard leads to instant reinvigorated play with these animal friends. Writing center stocked with supplies, made from a typewriter or printer stand. Another strewing concept is to carve out little nooks or “stations” that can invite a certain kind of play or interaction. 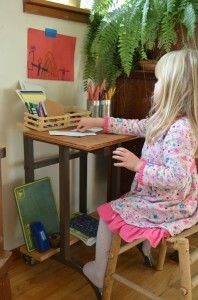 A mini writing center tucked onto a small side table, kid-sized table or eye-level shelf, with different sized notebooks and papers, envelopes, stamps, post-its, stickers and writing utensils might be all it takes to engage a wandering kid in the kitchen, hall or living room. A science corner can be set up with an assortment of magnets and jars or containers, or a tray can be set out in the kitchen with droppers, jars of vinegar, baking soda, and water colored with food coloring (depending on the age of your scientist, of course), begging for some chemistry or color mixing exploration. Outside, strewing some pots, pans, spoons and stirrers into a mud pie kitchen might be a way to build creative play into your outdoor routine. Building a “fairy garden” or other inviting planter or pot (indoors or out) that combines touchable plants with intriguing objects or toys might be an enticing invitation, as well. Natural objects are fabulous strewing objects, and they’re generally free and very engaging. 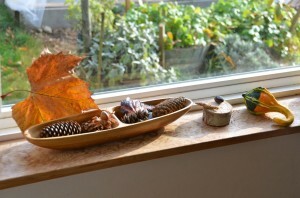 We have a windowsill “nature table” where I started leaving the objects my girls collected, as well as stuff I found that I thought they might like (shell collections, interesting nuts and pods, feathers, shiny stones). They gravitate towards this area and love to fill little buckets (or bowls from the play kitchen) with these found objects, again and again. I also seek out divided wooden bowls or platters, baskets and containers at garage sales or second hand stores that work well to “strew” natural objects into on a table top or play shelf but still keep them somewhat contained. These items are fun for the pure sensory factor, but my girls often love to fill up containers with them, then launch into pretend play, transforming them into cereal, cookies or drinks, or using them for their “shopping”. Elsie and Delia in the "bean pool" out on our porch. You don't have to fill it up to have some fun! Sensory play is another great method of strewing, and easy to change up when the inspiration hits. While a sensory table is great, low-sided tubs (dish tubs are a good size), trays and containers work well too, and are a lot more portable and easy to store. Have the space for something big? 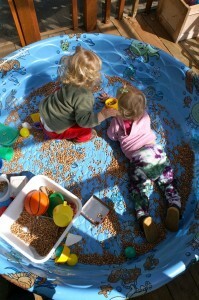 We have had great success with a kiddie pool for sensory play — you don’t have to fill it up to have fun, too. Dried beans are an old standby for sensory play, but also a hit around here are sand, pompom balls, styrofoam peanuts, marbles and gemstones. I have heard wonderful things about flax seeds but haven’t tried them yet. For the smaller items (beans, seeds, peanuts, sand) adding things in the tub to dig around and discover (pinecones or stones, little people or other small toys and treasures, spoons and scoopers, brushes, etc) are fun. For the larger objects like pompoms, gems and marbles, I’ve found setting them out with divided containers, like ice cube trays, silverware dividers, separated bead boxes, tackle kit-like organizers and the like are very intreguing to my girls. Leave out some tongs to throw a more little fine motor practice into the mix. I do try to just let my kids explore on their own, though little lessons about how to use the tools (like tongs) are important at times, too. Just tread lightly, so as not to interfere in the moment. Strewing is not a directed lesson or guided activity — though it can spark that kind of thing in time, if the child’s interest is there, or follow as an invitation for more discovery if a discussion or tool has been recently introduced. I’ll leave you with a list of ideas for possible strewing — the sky is the limit, really. I have various goals for strewing depending on day — sometimes it’s just to change the vibe or break a rut, engaging my kid in something different that what she has been doing lately. Other times it’s bringing out a favorite type of plaything or activity I know she loves and has been into lately, so it’s more of a “sure thing”. There are no rules to strewing, other than to strew widely and diversely. You can even strew outside of the house — outings are a way to “strew” your children’s paths with new sights, sounds, people and ideas as well. Sometimes strewing just means dumping or spreading out toys or maniplulatives on our living room table. The kids see it and dive right in! What kind of “strewing” do you do? What has been a hit with your kids, or what do you want to try? This post is full of awesome ideas! My baby is only 6 months old, but I already do some “strewing” things with him. I’ll get out a toy and set it near him or I’ll play with it myself and see if he gets interested. I’m looking forward to diving into other things you mentioned as he gets older. I have been calling this ‘staging’. Usually I will find something that’s been neglected (toy animals, blocks, dress-up wear) and set it up while the kids are elsewhere to make it look inviting. Then, I wait and see what happens! Sarah, yep, “staging” sounds good and I think of it in that way too. Issa, I think strewing (or “staging”!) works for all ages, and it sounds like you are doing it with your little guy too! Melissa, yep, if you are unschoolers I bet you know this concept well! I have several unschooling and homeschooling friends who are great strewers! These are great ideas! I love doing this as well and need to do it more often. It seems like having ALL the toys just makes it harder for little ones to choose. Your animal/Flubber combination was a huge hit here! Glad you guys had fun with the flubber animals too, Lauren! I love this idea! 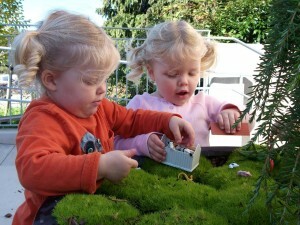 It could be so much fun, and a great way of helping #1 learn to really LOOK at the world. I’m going to give it a go! Love all of these ideas – thank you!